To get people (students, coworkers, …) warm for Lean there are various (warm-up) games available. The one described here was taught to me as the “Lean Cup Factory” by Nathalie during my Master-after-Master training. The goal of this exercise is to let the players really experience that a process to produce value (for your customer) is not achieved by the first attempt. Further, the players (and observers) will learn to build quality in, analyse & optimize processes and cooperate. For this exercise you need 2 groups of 5 players. No prior experience is needed. If players know the game, give them the role of the customer. For this exercise you need 45 minutes, including explanation on start and review afterwards. 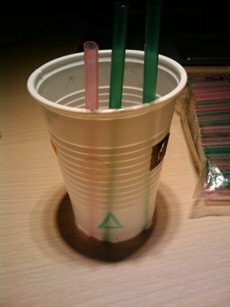 Create one end product: a paper cup with at least 3 stickers, 2 permanent marks (one on the side and one on the outside bottom) and two straws of equal size and a third straw a little bit larger. There are three production rounds in total. One round takes one minute. During the round, the players cannot ask questions to the customer. Only after a round they can ask you (the customer) questions. During the round, players cannot talk to each other. During the round, only one player can move between other players and help them out. Between the rounds, the players have 5 minutes to discuss the process, make adjustments to it and set a new target. Step 0: explain the game. Step 1: divide the group in two equal groups: process workers and observers. Step 2: show the group the end product. Give them the opportunity to ask questions. Step 3: give the group 10 minutes to design the process. 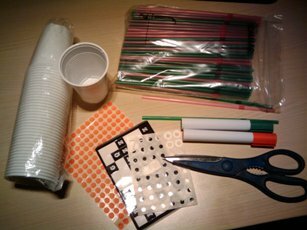 Step 4: let the group make an estimate of the accepted cups for the first round. Step 5: round 1 – the players get one minute to produce and reach their target. 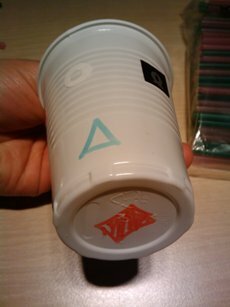 Step 6: as customer, review all the cups produced and let the players know how many are approved. Step 7: the players have 5 minutes to discuss the process, make adjustments to it and set a new target. Do not answer more then to the question asked. When you review the end product the players produce, be strict on colors, order and size. Let the players find out themselves why their end product is declined by asking you questions. Ask both groups (process workers and observers) to describe the exercise from their point of view. How do they think they can improve further upon the process? Why didn’t they make the process right in the first time? What did they learn about the Voice Of the customer? Processes can be optimized. All the time. Build quality into the process.